Simply plug these handy switches into an open channel of your R/C receiver for complete control of your ignition kill, magneto shut off, lights or anything you can dream up! 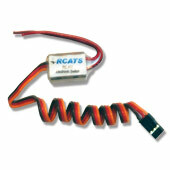 The RC-110 consumes very low power, and has a high current carrying capacity (Capable of 10 amps at 30V!) Normally open contacts.